This wonderful easy day tour leads us to the Lower Kartli. Explore ancient history of Georgia, Extensive archaeological site of Dmanisi, where was discovered earliest hominid remains beyond Africa (1,8 million years ago), oldest extant three-nave basilica with the oldest inscriptions in Georgia (494 AD) etc. Easy day trip, upon the request can organize in any date during the all seasons. transportation, guide service, water, Wine tasting from the “Wine trails” collection. Bolnisi Sioni Cathedral is a Georgian Orthodox basilica, was built in 478–493. It is the oldest extant church building in Georgia. Bolnisi Sioni Cathedral is known for its Georgian Bolnisi inscriptions. These are one of the oldest historical documents of the Georgian alphabet. Tsughrughasheni is situated approximately 2 kilometres from Bolnisi Sioni basilica, on the right bank of the Bolnisistsqali River. The church was built in 1212–1222 supposedly by King George IV Lasha of the Bagrationi Dynasty. The Tsughrughasheni church resembles stylistically the other Georgian churches from the 12th–13th centuries – Betania, Kvatakhevi, Pitareti – but it is smaller than those and has a higher cupola. The plan of the church is right-angled. The church is rich with the Georgian traditional ornaments adorned. The town of Dmanisi is first mentioned in the 9th century , though the area had been settled since the Early Bronze Age. An Orthodox Christian cathedral – “Dmansis Sioni” – was built there in the 6th century. Located on the confluence of trading routes and cultural influences, Dmanisi was of particular importance, growing into a major commercial center of medieval Georgia. The town was conquered by the Seljuk Turks in the 1080s, but was later liberated by the Georgian kings David the Builder and Demetrios I between 1123 and 1125. The Turco-Mongol armies under Timur laid waste to the town in the 14th century. 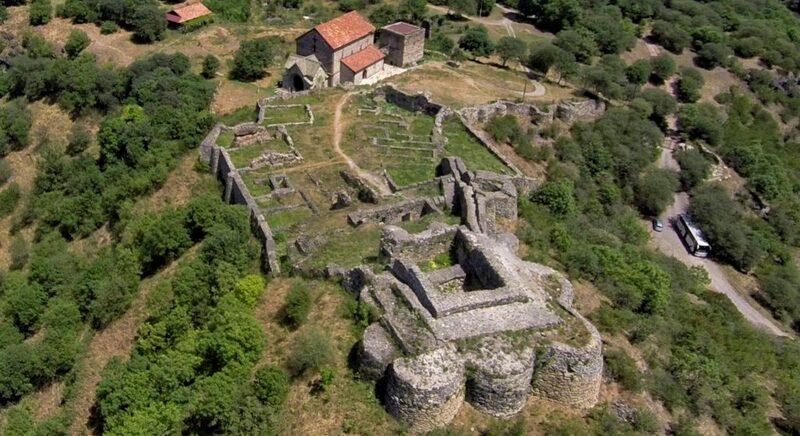 After invasion of Turkomans in 1486 , Dmanisi never recovered.The castle was controlled by the House of prince Orbeliani. Extensive archaeological studies began in the area in 1936.The hominin remains discovered in 1991 at Dmanisi, (1.8 million years old) are the oldest found outside Africa.